It’s that time again! National Margarita Day! It’s that time when visitors from around the world enjoy margaritas at their favorite Las Vegas bars and restaurants. But here’s our tip for enjoying this most epic of made-up national holidays: Don’t go to Cabo Wabo Cantina at Planet Hollywood, or any Las Vegas bar or restaurant with the dreaded CNF charge. Behold, the infuriating charge that makes us want to choke someone to death. And not in a good way. Restaurants like Cabo Wabo Cantina should provide pitchforks along with their tortilla chips. The ridiculous, annoying and should-be-banned “Concession & Franchise Fee” runs from 3-5%, and is presumably related to fees charged to venues by the casinos they’re attached to, sort of a surcharge for a restaurant having a great location. Yes, all kinds of WTF. Honestly, who knows and who cares why it’s charged? It’s a disgusting, shameless money grab, and we haven’t been back to Cabo Wabo Cantina since the last time we were dinged by this CNF charge. If this charge is necessary, why doesn’t every casino restaurant include it? And why is it a separate charge, as opposed to being folded into the overall costs of food and drinks, as other operating costs are? It takes a lot for us to turn down a margarita, but the CNF charge does the trick. Cabo Wabo Cantina isn’t the only CNF culprit. Other restaurants with CNF charges include Rhumbar at Mirage, as well as Hexx and Beer Park at Paris Las Vegas. For shame. Read more. Want to avoid the concession fee? Ask if the restaurant charges it before you ever sit down. If you love the place, a few extra bucks might not matter. But maybe it should. If we pay this fee, we’ll be seeing more restaurants charging it, you can bet on that. Like most things in Las Vegas, we get to vote with our dollars. 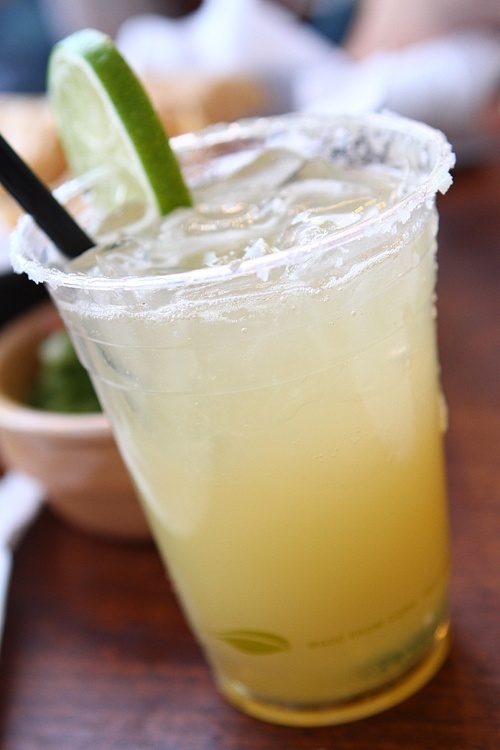 So, we vote for celebrating National Margarita Day somewhere else, thanks. Update (2/28/18): We’re pleased to report Señor Frog’s at TI has discontinued its CNF charge. It does add an entertainment tax charge when it has live music. Update (3/14/18): Alexxa’s Bar at Paris Las Vegas can be added to the list of venues that charge a 4.7% concession fee. This entry was posted in Las Vegas, Las Vegas Bars, Las Vegas Restaurants, Las Vegas WTF on February 22, 2014 by Scott Roeben. Do they have to post on the menu about the fee? Not sure if it’s required, but Cabo Wabo appears to do so on theirs. I never heard of Concession & Franchise Fee. What a rip-off. Does this happen in other cities that have chains operating in resorts or hotels? I’ll pay for food and service but not this! Agreed. Unacceptable. We haven’t heard about it anywhere else. Ha! Agree, John. This fee is made worse by the fact the bill is presented after much alcohol has been consumed. The food’s OK, but the liquor is their focal point. This sounds sneakingly familiar to the “CSF” fee Rhumbar at Mirage and Casa Fuente at the Forum Shops charge. Ew. Wasn’t aware of those. Maybe time for further investigation. Thanks for the tip! When I see CNF, that equals “No Tip” for me. If they’re going to be that underhanded, then I can’t respond by giving them extra money. Please don’t take out your frustrations with the management’s decisions by stiffing the waiter. Thank you. Agreed. Two separate things, but the temptation is definitely there just because of the frustration factor. I’m an industry veteran and I’d be tempted to do it to them. The thing with this is that you have to tell the waiter *exactly* why they’re getting a reduced tip, otherwise they’ll just figure you’re a cheap jackass. Yeah, and as you said, it’s not their fault. Unfortunately, Jon, those two things aren’t related. Although, if waitstaff gets enough negative feedback, they could put pressure on the restaurant to change this policy. Exactly, my tactic has been to compute the tip and then subtract the CNF fee from it. Let the wait staff complain to their management about this bogus fee! I always write it on the receipt so they know why the tip was less than 20%. It would seem to me that if such a fee is not legally mandated by the municipality government, and it is not specifically disclosed on the price list (menu), then the establishment would have no legal basis to enforce collection of the fee if someone protested. Agreed! Guess they have it on the menu, but curious what would happen if someone refused to pay it. Managers might have the ability to remove it. Concession and Franchise Fee? As in, we have to pay the rent and the corporate office fee? Funny, I thought $17 for a cheeseburger would more than cover that. Apparently not. 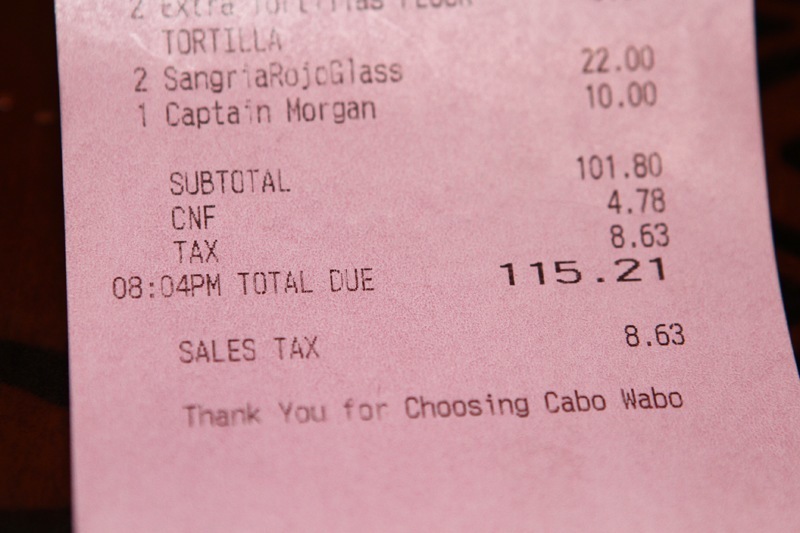 Note that neither the Cabo Wabo location in Hollywood nor the original in Cabo San Lucas have this ridiculous fee. I’m sure someone at the CW corporate office already knows, but it wouldn’t hurt to call them to let them know exactly why you won’t be returning to their establishment. Completely agree. If enough people complain, they’ll make it go away. The regular menu prices might go up, but then at least it’s up front, and customers can make their own decision at that point. Thanks for the heads up. Definitely won’t be going there or anywhere else with such a fee. Agreed. We don’t expect to return if that fee persists. I can verify that Sugar Factory does indeed charge this insidious fee. Just had dinner there on Friday night and I am looking at my receipt. Not going there again. Too bad. I really liked the place. We just got hit for it at SUGAR FACTORY and the manager said it used to be printed on their old menus but didn’t make it onto the new menus. WTF? I will ALAWAY pay the CNF fee…… Only AFTER I complain to the manager AND explain to the nice waitress why I am not tipping her well. See,…. I can COST SHIFT AS WELL. Perhaps the employees not being tipped will force the restaraunts to change quicker. But ensure to TELL them why you are not tipping! That seems fair. We miss going to the places that have it a little, like Cabo Wabo and Sugar Factory. But it’s the price they pay for adding ridiculous charges. I would simply stiff the server and feel good about it. Awful. They’re on our CNF boycott list. Just ate at Hexx last night and noticed the cnf charge and asked the waitress about it. She gave a strange explanation then said she could remove it if we wanted— uh yeah, please remove- and she did! Great to hear, Candice, thanks for sharing that! CABO WABO GOT ME ON 8/23/2018. FOUND OUT WHAT IT WAS ON THIS SITE. BASTARDS! REMINDS ME OF THE SAN FRANCISCO BUBBA GUMP SURCHARGE TO “OFFSET THE COST OF DOING BUSINESS IN SAN FRANCISCO” THIEVES. Sorry to hear that. Haven’t been to the place for years now because of that fee. I hope they find it worth alienating people who might otherwise have been regular customers.